Located in the heart of Coos County, just south of the regional hub of Myrtle Point, the small community of Broadbent, Oregon provides a peaceful and private environment for its residents. Approximately 30 miles from the popular beach town of Bandon, Broadbent is off the beaten path, but reasonably close to many of the attractions and larger communities of this secluded area. Homebuyers interested in finding their perfect home in this area will be pleased to find a selection of single-family homes set back in lush woodland surroundings. With home prices ranging from $120,000 to $400,000, there are a variety of options to suit many budgets and lifestyles. Broadbent’s location in Coos County makes it a desirable area for many different types of home buyers, especially families interested in providing their children with a safe and secure environment with small schools and room to explore. In addition to the abundance of naturally beautiful scenery, this area is also home to a variety of recreational facilities and parks. Access to hunting, fishing, and camping areas allows residents to take advantage of the mild weather, and enjoy the benefits of spending time outdoors. Families will love the community spirit of this area, with events like the annual Coos County Fair providing great fun for all ages. With all of these wonderful amenities, and many more, Broadbent is a great place to buy a home. 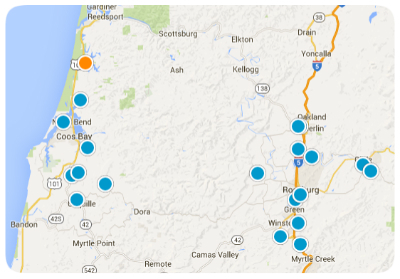 For more information about the real estate options in Broadbent, Oregon, please do not hesitate to contact us today!